VIRGINIA INDIANS: Today is the final day of Native American Heritage Month, and you can listen to me speaking about Encyclopedia Virginia‘s Indian content on WINA radio. Many thanks to Jane Foy and Rick Daniels for having me on their Morning News show. It was a lot of fun! And remember: this is a good place to start when you’re looking for a thorough and authoritative online history of Virginia Indians. Also visit the Virginia Indian Heritage Programs at VFH. WOODROW WILSON: The twenty-eighth president of the United States—and Virginia native—has been in the news recently. An African American student group at Princeton, where Wilson served as president from 1902 to 1910, is attempting to raise awareness of Wilson’s views on African Americans and his actions, as president, to re-segregate the federal government. Although remembered largely as a reformer, Wilson was responsible for notoriously regressive policies with regard to race. At Princeton, he had presided over the only major northern university not to admit black students, even actively discouraging black applicants, and as U.S. president, he authored legislation that would have curtailed African American civil rights. When Congress failed to pass it, he used his executive authority to segregate the federal government, pushing blacks out of positions that traditionally had been reserved for them. 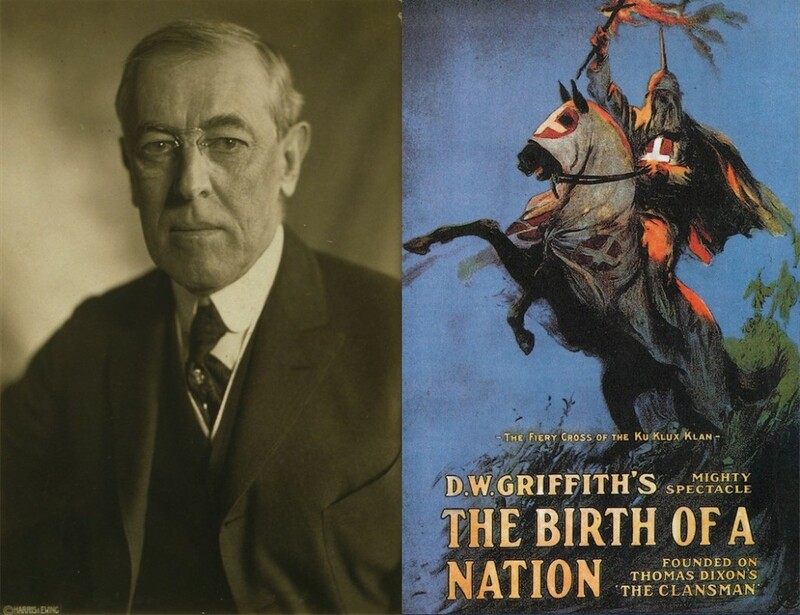 In 1915, Wilson viewed the new motion picture Birth of a Nation, directed by D. W. Griffith and infamous for its negative portrayal of African Americans and its glorification of the Ku Klux Klan. Wilson is said to have exclaimed, “It is like writing history with lightning,” although this is likely apocryphal. In fact, Wilson’s own History of the American People (1902), authored while he was at Princeton, was somewhat sympathetic to the Klansmen, who, he wrote, were only protecting themselves from “the principal mischief-makers of the reconstruction régime,” primarily northerners who moved south and “deliberately sowed discord.” Wilson’s book was more critical of the Klan than Birth, however, as he noted “society was infinitely more disturbed than defended.” Despite such mild criticism, Wilson’s writings supported an interpretation of Reconstruction (1865–1877) that was gaining influence in both the North and the South and History of the American People was one of the books that influenced the creation of Griffith’s movie. Speaking of Birth of a Nation, our friends at BackStory with the American History Guys just did a live show at the Smithsonian that considered the legacy of that film. For more on the Wilson debate, you can read this New York Times op-ed penned by the grandson of a man pushed out of one of those jobs traditionally reserved for African Americans. You can also visit the Atlantic magazine’s blog, Notes, which is airing other points of view. KEEPING IT ALL UP TO DATE: That’s the upside of being online: we can update our entries when appropriate and fix mistakes when we find them. Toward that end, we have been editing an entry that contained some information slightly different from what we’ve already published about which English minister married Pocahontas and how many English colonists died in the Indian attacks of March 22, 1622. With the invaluable help of our friends at the Dictionary of Virginia Biography, we have made a couple of clarifications. Regarding Pocahontas’s marriage to John Rolfe, there was some confusion about whether it was performed by Richard Bucke or Alexander Whitaker. Both men were ministers working in the colony at the time, and Whitaker was responsible for converting Pocahontas to Christianity. Sources either disagree or leave unclear which of them performed the wedding, however. We had previously said it was Bucke. Now our entries either do not speculate or suggest that it could have been either man. As for the percentage, the best estimate of the colony’s total English population at the time is 1,240, which means about 28 percent if we are to believe the 347 figure. We say “nearly a third” because some historians have suggested that the death totals may have been higher than 347. But, as with so much, we don’t know for sure! If you see a mistake or want a clarification on something, please let us know by sending an email to [email protected]. Is any factual information known about the young English interpreter Henry Spelman concerning his leaving descendants? who survived and produced children? Thank you so much for your time. If there is a charge, please let me know where I can pay you.